ACOs, Meaningful Use (aka MU), the persistent ‘whitewater’ of health reform and the quest for the elusive ‘triple aim’ will be at the center of our chat today on Meaningful Use: MU Live Radio. 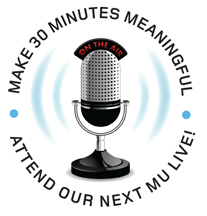 MU Live! is a 30 minute internet talk radio show hosted by our HITECH Answers experts. Our session experts discuss breaking news and issues on meaningful use as well as other health IT topics. For more information including past guest segments, click here. To register to listen to today’s broadcast at 11AM Pacific/2PM Eastern, click here. Received too late to take part-is there an archive available? Hi Chris: I think they do archive for replay on MU Live.